This month's Daring Baker challenge is a milestone. Natalie from Gluten A Go Go and Shel from Musings From the Fishbowl chose lavash crackers for this month's Daring Bakers' challenge and for the first time in DB history, we are going vegan for the challenge. They even included a recipe for gluten-free lavash if we wanted it to be both vegan and gluten-free. 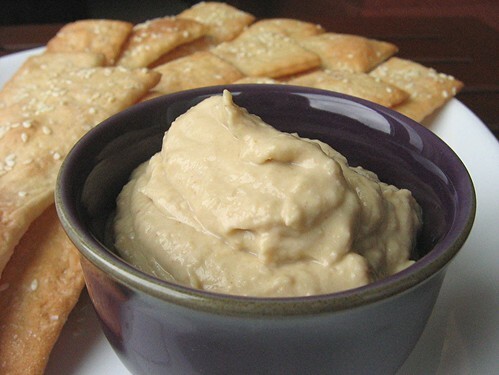 They also asked us to make a dip or spread to accompany our crackers as long as the dip or spread is vegan too. They gave us a lot of freedom to personalize the challenge. I wasn't feeling too creative (my fault, not the challenge's fault) and I decided to go basic. Sesame seeds and sea salt to sprinkle on my lavash with a hummus for my dip. The lavash was really easy to make. I guess the hardest part was trying to roll it thin enough. I only had a rolling pin to help me. A pasta roller would've helped but I lost mine while moving a few years ago and I haven't bought a replacement yet. After rolling out the dough, I trimmed the edges a little to make it fit my baking sheet pan. I used the edge scraps to make some short and skinny "breadsticks". My nosy curious cat had to come by and take a sniff while I was taking pictures. Overall I really like this recipe. It's a definite keeper. I plan to use it again for making breadsticks or even a thin crust pizza. Thanks Shel and Natalie! 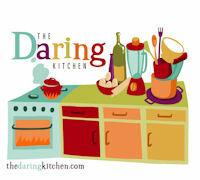 And please go to the Daring Bakers blogroll for links to other posts. 1. In a mixing bowl, stir together the flour, salt, yeast, agave, oil, and just enough water to bring everything together into a ball. You may not need the full 1/2 cup + 2 Tb of water, but be prepared to use it all if needed. 2. Sprinkle some flour on the counter and transfer the dough to the counter. Knead for about 10 minutes, or until the ingredients are evenly distributed. The dough should pass the windowpane test and register 77 degrees to 81 degrees Fahrenheit. The dough should be firmer than French bread dough, but not quite as firm as bagel dough (what I call medium-firm dough), satiny to the touch, not tacky, and supple enough to stretch when pulled. Lightly oil a bowl and transfer the dough to the bowl, rolling it around to coat it with oil. Cover the bowl with plastic wrap. 4. Mist the counter lightly with spray oil and transfer the dough to the counter. Press the dough into a square with your hand and dust the top of the dough lightly with flour. 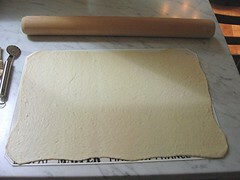 Roll it out with a rolling pin into a paper thin sheet about 15 inches by 12 inches. You may have to stop from time to time so that the gluten can relax. At these times, lift the dough from the counter and wave it a little, and then lay it back down. Cover it with a towel or plastic wrap while it relaxes. When it is the desired thinness, let the dough relax for 5 minutes. Line a sheet pan with baking parchment. Carefully lift the sheet of dough and lay it on the parchment. If it overlaps the edge of the pan, snip off the excess with scissors. 6. 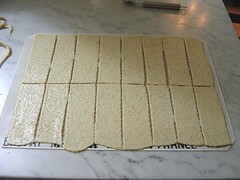 Bake for 15 to 20 minutes, or until the crackers begin to brown evenly across the top (the time will depend on how thinly and evenly you rolled the dough). On a cutting board mince and mash the garlic to a paste with the salt. In a food processor purée the chickpeas with the garlic paste, the tahini, the lemon juice, the oil, and the water, scraping down the sides, until the hummus is smooth and add salt to taste. Add more water, if necessary, to thin the hummus to the desired consistency. Transfer the hummus to a bowl. The hummus may be made 3 days in advance and kept covered and chilled. Sprinkle hummus with the pine nuts if desired. Your breadsticks are just beautiful! They look like willows they are so graceful. I'm so glad you liked this challenge! I love Hummus and your crackers look wonderful! A delicious combination! Very well done! Aahhh! Breadsticks, now that would have been a great idea. Your crackers and hummus look just great. HOORAY!!! Love this month's DBC, for sure - so fun and unique!! love the kittie next to the sicks..perfect shot! Love the breadsticks! Great rolling with just the rolling pin, so nice and even! Oh my gosh I thought of a pasta roller too while I was doing the challenge!!! I'm very envious of how perfectly rolled-out your cracker sheets are. Nice job, Mary! 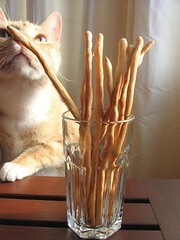 The bread/crakers look wonderful with the hummus - but I really love the picture of your cat with the bread sticks! My original idea was to go for the sesame & salt version. But alas, no sesame in this home! I love your idea for a thin crust pizza with this. That sounds perfect! Oh my golly a cat!!! I'm so enamored with your cat right now. I've got to go back and look at her again... Okay. I love the shape you took with your crackers and I love, love the breadsticks. Well done! Nicely done! I love the cup filled with the cracker sticks. Your crackers and breadsticks look wonderful! A perfect accompaniment to your hummus. Your crackers are beautiful! 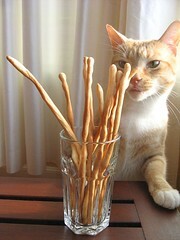 I love that shot of your kitty with the breadsticks, too! they look fantastic! i love the breadsticks (wish i'd thought of that!). and how gorgeous is your cat?!! LOVE the kitty photos! Everything came out so beautifully! I've just found that you returned to blogging, welcome back, it's good to see your posts again. 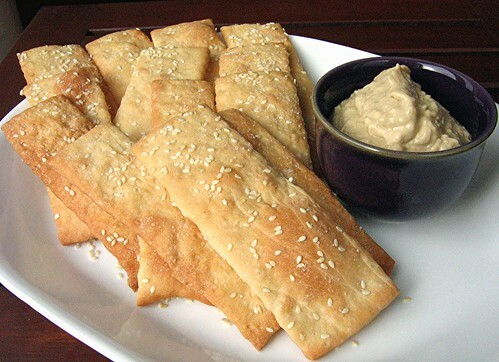 Nice job on the crackers and dip, I did almost the same thing - sesame seeds and kosher salt along with garlic hummus. Well done! Your lavash look wonderful and those breadsticks are a great idea! Your kitty pictures are adorable too. Well done! i love your breadsticks.. great idea. you're cat is adorable too ! Darling photos of the cat, plus pretty breadsticks and great looking crackers. The hummus looks perfect, too! Ha! I made garlic hummus and didn't know how much garlic to use...so I used EIGHT cloves in ONE can of chickpeas! WOW! That stuff was potent...it burned! Yours looks great. I have decided I should make my hummus b/c I eat it so much and making is so much cheaper than buying pre-made. The sticks are such a great idea! Your crackers and breadsticks look lovely. I made a kamalata hummous to go with mine and it was gorgeous. I really enjoyed this lavosh recipe. Simple and yet, wonderful at the same time. What an opportunity to be really creative! Breadsticks are a great idea! Wonderful! Your crackers and hummus look wonderful. The breadsticks are a good idea, I had a little bit of dough left over after trimming the dough. As always, Mary, you've done a beautiful job with the challenge. Your crackers and dip look lovely but my heart has been won over by the beautiful breadsticks. Hehe great pictures. 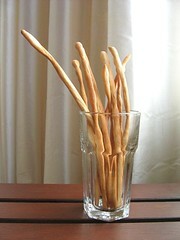 Love the breadsticks, could have used them as a table center piece. My cat constantly tries to get in my pictures. Too cute. Great job with the challenge and I love the breadsticks! Hi there, I didn't know you were back in action, I'm so glad!! I saved your blog in my 'puter faves but I stopped checking on it because for some reason,that pic of your blender just made feel so sad, even I don't even know,I'm so happy to see you active and full of energy,thanks for sharing. Now thats a great idea to use a thin crust for a pizza. i'm gonna go for bread sticks when i make this next. they look so elegant. this was a great challenge!